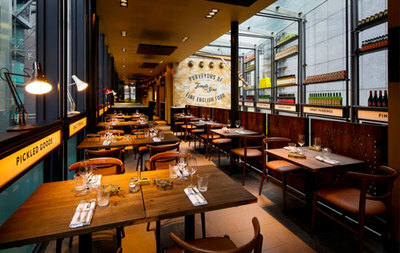 On 21st November, The Social Company opened the doors to Temple and Sons, a new City grill restaurant and bar. Situated adjacent to the iconic Tower 42, Temple & Sons is a second partnership for Jason Atherton with Restaurant Associates. With a more casual approach, it contrasts the high-rise fine dining at neighbouring sister restaurant, City Social. The venue is set across two floors, each offering a different dining experience: a 66-cover grill restaurant and a 30-cover all-day deli and bar serving snacks and small plates, championing British produce throughout. Executive Chef, Paul Walsh, who also heads up City Social, is overseeing the kitchen, working closely with Jason to create the restaurant’s more relaxed but equally innovative menu. The name Temple and Sons is a nod to the history of Tower 42; Palmerston House was previously built on the site, named after British statesmen Henry John Temple, Third Viscount Palmerston, who was twice Prime Minister in the mid-nineteenth century. On the ground floor deli and bar, the menu and interiors are inspired by a traditional British grocery store, complete with artisan snacks and sandwiches including game sausage roll, creamy mash & HP gravy and Old Spot spiced pork belly sandwich on brioche, spicy slaw & butter lettuce, alongside a range of British cured meats from Cannon & Cannon. At night the deli transforms into a cocktail bar, with carbonated cocktails canned on site, including Strawberry Can Can (Monkey Shoulder whisky, Chamberyzette strawberry wine, Chambord, Campari) and Peach Tea Pop (Monkey Shoulder whisky, Rinquinquin peach liqueur, Earl Grey tea, sweet & sour). Cocktails served in card milk cartons and cans again take inspiration from traditional British provisions, such as Yellow Paint (Sailor Jerry spiced rum, Colmans mustard, elderflower, lemon) and Martinny (Ford’s gin, Lea & Perrins distillate, fino sherry, olive). Also available for the first time at Temple and Sons is The Social Company’s own signature bottled English lager, The Subtle Fox. Upstairs, the restaurant kitchen operates entirely from a custom-built grill using varying types of wood, charcoal and hay. Continuing the theme of British heritage, many dishes are designed for family-style dining, with grilled fish and meat served whole or in large cuts, with a selection of sides to share. Comforting and nostalgic but with the group’s characteristic focus on innovation and flavour, dishes include wood-fired pork chop, collar & crackling with sage & pine nut crumb and Maldon oysters Rockefeller, baby fennel & confit lemon salad, tartar sauce & crispy potatoes. For dessert, the menu plays on Britain’s great repertoire of puddings with the likes of trifle, gingerbread, poached rhubarb & crystallised ginger and caramelised vanilla rice pudding with pistachio & homemade jams. Overseen by Russell Sage Studio, the interiors have been designed to evoke a Victorian grocery, with stacked timber shelves brimming with a variety of goods. A palette of rich, caramel tones with flashes of orange and teal create a warm and inviting space, with timber panelling embellished with antique brogue detailing and brass ironmongery. Feature lighting includes Victorian angle-poise lamps and a custom-made feature light suspended over the staircase between the two floors. For more information, visit templeandsons.co.uk.